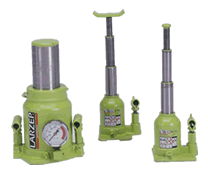 Larzep Jacks are made to the highest standard, used heavily worldwide in some of the toughest environments. Our Bottle Jacks are extremely versatile, they can be operated in both vertical and horizontal positions and come in a wide range of specifications to suite your application. Ranging from 2 – 50 ton the selection is available in telescopic and gauge fitted variations. The Trolley Jacks come with a foot pedal to allow the saddle to be raised and lowered quickly, and is made with a rugged frame for heavy duty operations. It also has built in safety features like the dead mans handle to allow controlled lowering speed and the safety valve to prevent overloading. Models range from 2 – 20 ton.